I am experiencing a lot of troubles with the check out. At first I tried to pay via Visa and like other people said in the other thread, it brought me back at the checkout without much explanation and the payment didn't work. After that I decided to attempt to pay via paypal wich worked fine. The payment went throught and everything seems fine. Tho in my order status it says the payment ''failed''. I contacted paypal and they confirmed to me that the payment has been made, that everything is in order and that the money has been sent. I see you activated your account which is great. Now you want to message Sander. But I think he is on a business trip today (england maybe?). So try Marrit. Click on this link and then click on "send me a message". Hopefully she isn't also on the trip. Or you could message them both. cheers and thanks for the help! Yay!! Glad to hear you got it sorted out. We're looking forward to hearing what you do with the printer. What are your plans?? Got a couple of model ready to print aldready! Otherwise I've been working on a jinx fanart recently from league of legends and I will probably finish her and give it a cool pose so I could print her too! Her left elbow *might* needs support. the tip of her hair can't just be floaing and so, um, hair like there. If you can make it less whispy then you can add break-off-support. The way the boots curl under themselves - you need to make it solid under there - connect the upper boot straight into the boot. The tips of her fingers need support. Consider having her hands touch her hips or thighs or bend an arm and touch the chin or something. Thanks for the input Gr5! Yah I'm aware that I will need to add support and do some processing before actually printing. 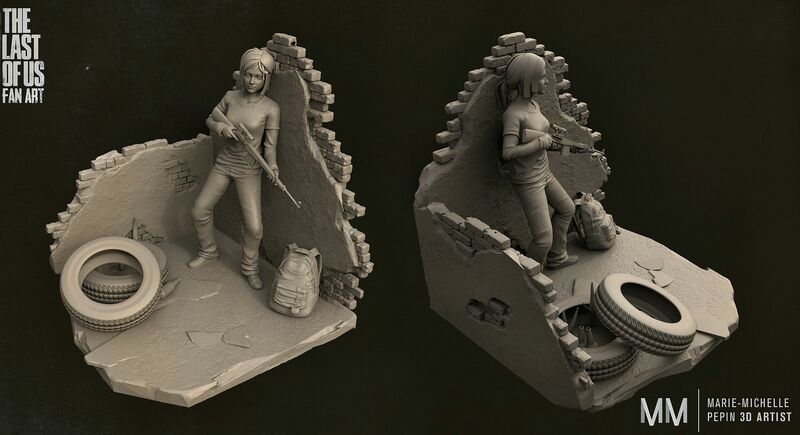 I already thicken some part on my Ellie model because some where way to thin. I'm not sure how you guys verify efficiently if some part are at least .4mm? So far I only printed on a stratasys and it's basically a ''plug and play'' printer so never had to do any extra step except adding some thickness to different part. When it comes to jinx Yah this is just my zbrush model I will use to do a game resolution model so nothing has been done to make her ''printable'' I am going to remove the small flothing hair and make sure to pose her hand on something cause those finger ain't gonna do it hehe. Thanks for all the help, I think it's gonna be a pretty big learning curve but i'm sure it's gonna be fun. I'm not sure how you guys verify efficiently if some part are at least .4mm? Then it should slice within maybe 10 seconds (you'll see a progress bar) and then on right side change view to "layer view" - actually before that maybe do xray view - if you see any red in xray view those are potential problems with your model. Then do layer view and scroll through the layers particularly checking the layers you are worried about. I'll make sure to check this out before my machine arrives! !